Ethel's younger brother David Greenglass had joined the Young Communist League in 1943, and after keeping his communist associations secret, was assigned to the top secret Manhattan Project (developing the first atomic weapons), from July 1944 - August 1946. In 1950 espionage activities during and after WWII were uncovered, with the result that David Greenglass was arrested; he quickly implicated his brother in law Julius Rosenberg. Ethel and Julius Rosenberg were then charged with conspiracy to commit espionage and passing information to the Soviet Union. Julius and Ethel Rosenberg refused to give any testimony at their trial and were convicted on March 29. They were sentenced to death on April 5, 1951 and executed by electric chair on June 19, 1953. After Ethel and Julius Rosenberg's executions, their young sons Michael (b. 1943) and Robert (b.1947) were abandoned by frightened relatives and eventually adopted from an orphanage by teacher and social activist Abel Meeropol; they took his last name. David Greenglass was convicted of his espionage charges and was imprisoned for 9 years, until 1960. As a senior citizen in the late 1990's and 2000's, Greenglass said that he had lied about Ethel's involvement in order to protect his wife Ruth, and implied that Ruth had typed up the notes to give to Julius, not his sister Ethel Rosenberg. David Greenglass was a 92-year-old nonagenarian senior citizen living under an assumed name when he died in a New York City nursing home in July 2014. By March 1951, the Korean War had been underway for a little over 8 months. On March 7, 1951, the Operation Ripper attack by the Eighth Army commenced, under the direction of U.S. General MacArthur, the Supreme Commander in Korea. By March 12 1951, the city of Seoul, Korea had been recaptured by United States/United Nations forces and Operation Ripper was completed. A month later, General MacArthur was relieved of his command by U.S. President Truman for a variety of reasons, including threatening to destroy China unless it surrendered. Yul Brynner also starred in the 1956 movie Anna and the King, and was in several revivals of The King and I. Just before his death from lung cancer in 1985, Brynner completed another 4-year run in The King and I on Broadway. 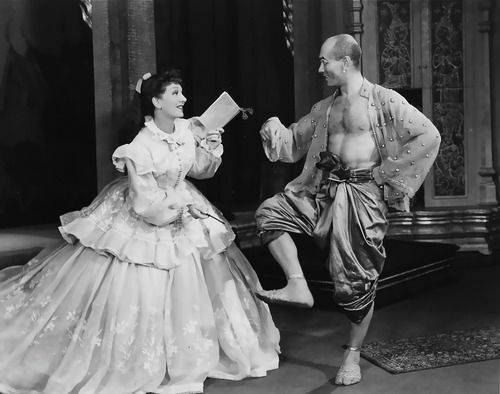 All told, Yul Brynner was in 4,625 performances of The King and I on stage.